Sometimes, you just need a beach getaway. Unfortunately, you also often need a thick wallet to enjoy one properly. But before you convince yourself that you simply don’t have the cash for a vacation to fill-in-the-blank, take a look at our list of seven amazing beach destinations that are surprisingly affordable. It’s no secret that Greece’s economy has been struggling for some time, so the country has found itself on plenty of affordable getaway lists as of late — particularly in the wake of Brexit, which has made all of Europe potentially even more appealing to travelers. But for our affordable beach destination roundup, we’re highlighting the Greek island of Corfu. While most jet-setters head for the better known, more popular and significantly pricier Cyclades (made up of islands such as Mykonos and Santorini), Corfu is a great pick for those on a budget. Travelers can often score relatively inexpensive flights directly to the island by booking through smaller, regional airlines and once there, visitors will find that hotels, restaurants, and activities can be pretty cheap. Be wary of hotels advertising four stars (take a look at our photos first! ), but even if they aren’t quite up to a luxury standard, many Corfu beach resorts offer all-inclusive options and feature numerous pools, a range of dining and simple, clean rooms. Continually ranked as one of America’s best family beach destinations, Myrtle Beach offers visitors one-of-a-kind nightlife, more than 100 golf courses and 60 miles of sandy shoreline — all at affordable prices. Flying there doesn’t put a huge burden on the wallet, and it’s an easy enough drive from cities such as Charleston, Charlotte and Augusta. This locale may be known to get a bit jam-packed, but hotels account for this with massive pools and water park complexes, as well as plenty of meeting spaces and large rooms. In fact, many properties feature condo-style accommodations with kitchens and living rooms. While Lisbon lures tourists looking for a cultural fix, the Algarve attracts plenty of visitors seeking a relaxing beach vacation, thanks to its mild, year-round climate (it reportedly receives 300 days of sun per year) and stunning coastline. Finding itself at No. 1 on the U.K. Post Office’s annual Worldwide Holiday Costs Barometer — a study that takes into account common vacation purchases like the price of a meal for two, drinks in a cafe, and more — the Algarve is one of the best places for a budget getaway in Europe. With mid-range hotels like the Flor da Rocha Apartamentos Turisticos starting below $50/night, the cost of budget accommodations is low right now. Achieving an affordable vacation to Mexico often mandates sacrificing peace and quiet. Well, this may be the case with Cancun, but if you drive less than an hour from this affordable, party-centric locale, you’ll find Playa del Carmen, its more low-key, less crowded sister that, like Cancun, offers plenty of budget-friendly, all-inclusive resorts. Even though spring break is peak season, many hotels offer deals around this time, and day trips to spots like Cozumel and the Mayan ruins of Chichen Itza and Tulum are relatively inexpensive. Getting to Thailand does not come cheap, but once you’re there, you can live like royalty for a shockingly low fee. The beach town of Phuket in particular is home to some of the most luxurious resorts in the world, and yet even the most exclusive properties offer rooms starting around $200/night. The same stunningly low rates can be found at restaurants, shops and spas. Naithon Beach is beautiful, and conveniently close to the airport, while Batok on Racha Yai island is arguably even more gorgeous and unspoiled. Patong Beach is also popular. Many major airports offer direct flights to Jamaica’s Montego Bay, where a handful of affordable accommodations can be found. But for those who don’t mind a slightly longer airport transfer, Ocho Rios (a couple hours from Montego) is an even more budget-friendly destination. (Some of Montego Bay’s resorts can be quite luxurious, and therefore expensive.) Once a sleepy fishing village, Ocho Rios is now home to numerous all-inclusives nestled among laid-back, local joints offering cheap beers and tasty jerk chicken. It also has beautiful, private white-sand beaches, and a famous waterfall park with swimming and hiking. Home to tons of all-inclusive resorts, the Dominican Republic is a solid pick when planning a wallet-friendly Caribbean getaway. Visitors can save by relying on hotels where everything — from activities to food, from entertainment to alcohol — is included, and with eight international airports on the island, it is often quite easy (and inexpensive) to reach. Add in lovely beaches, warm locals, great year-round weather, and a rich history for a wonderful beach vacation. Travelers can choose from hot spots like Punta Cana and Puerto Plata, or head to Samana, on the northeast coast. Samana is the country’s least developed and most serene section. 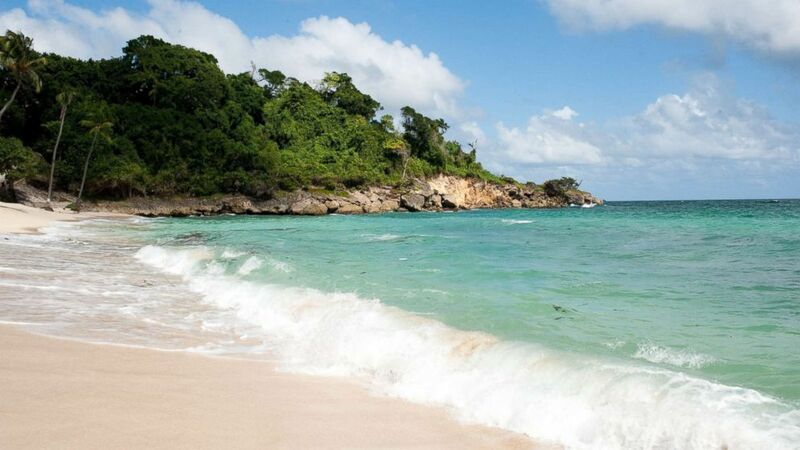 Its beaches, many of them remote and secluded, rank with some of the Dominican Republic’s finest, and the area is characterized by lush tropical forests, verdant mountains with dramatic sea views, waterfalls, and a handful of resorts that take full advantage of these natural wonders.